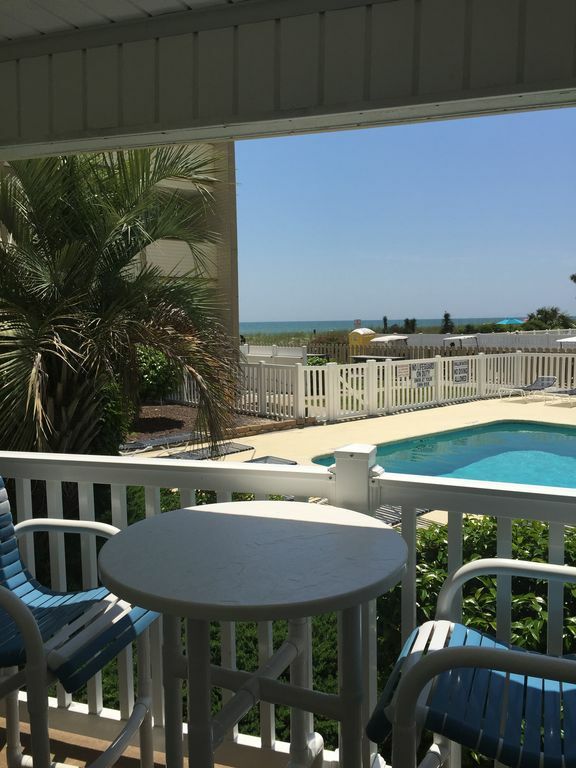 The condo is located on the ocean-side of popular Shore Drive in the desirable Arcadian Shores area of Myrtle Beach. The beach itself is among the finest on the Grand Strand. We are just steps to the sandy beach with no roads to cross. Shore Drive is not a through road, so there is less traffic. Getting here is easier due to the new Hwy 22 By-pass. Once you're here, it's a short drive to Restaurant Row, Carolina Opry, Barefoot Landing, Wal-Mart, Kroger's and several Golf Courses. It's a short walk to Ocean Annie's and the Apache Pier. You'll appreciate the convenience of being on the 1st floor. Free WiFi for our guests convenience. After enjoying the beach and surrounding attractions, you'll enjoy a good nights sleep on the new, luxury mattresses. Both bedrooms are fitted with room-darkening drapes and blinds. You'll feel at home with a fully equipped kitchen, Cable TV . Both bedrooms are equipped with LCD TVs. Enjoy the Swimming Pool and Barbeque Area. We enjoy the condo and know you will too. Sorry, no pets or smoking allowed. Cleaning fees are included in weekly rental rates. Please be sure to bring your own linens (sheets , 2 queens and 2 twins and towels). We decided to purchase our condo because of our love of the beach. We have a family business near Charlotte, NC and are getting ready to retire. We enjoy sharing our little bit of paradise with our tenants. Always liked Myrtle Beach. It is convenient and has so much to offer in the way of entertainment and relaxation. We enjoy being on the first floor overlooking the pool. We also like the laundry room being convenient to the condo. We enjoy the location of the property being close to shopping, Wal-Mart, Krogers, entertainment Pirates, Barefoot Landing (Alabama Theatre) and Carolina Oprey. And of course we enjoy being very close to Resaurant Row. It was absolutely perfect for us! It's perfect! It's seriously steps to sand. The pool was very nice and it was very close to the laundry room. The kitchen is perfect if you cook while on vacation. I seriously do not have ONE complaint. I would definitely book here again. Everything you could need. Comfort and cleanliness. Easy acces to the beach and pool. Thank you. Glad you enjoyed your stay and had a great time . Love all the updates. It is beautiful! We love staying in your condo. This was our 3rd year and we hope to stay again next year. I’m so glad you enjoyed your week and like the updates to the condo. Hope you’ll be staying again next year! We had a great week at this condo! Great location by the pool with a nice view of the beach. It's also very close to the laundry room which is convenient. The beds are very comfortable and the condo was clean. We hope to stay here again! This condo was everything as advertised. The location is perfect, close to everything you need, and steps away from the beach. The first floor is very convenient for unloading. The condo was clean, comfortable and a well stocked kitchen. I have rented many times and this was the best owner to deal with. The responses are always quick and very willing to help in anyway. We were barely home, bags unpacked and the the security deposit was refunded. I would absolutely rent this condo again. We had an amazing vacation here. It is a beautiful condo with a perfect view, we could see our older children at the pool while fixing lunch and they had a little "freedom ". Just steps from the beach and the location is absolutely perfect! Yes, we find the location is great and really convenient. The property is right on the beach and is located right across the street from a general store, liquor store, pizzeria, sub shop and more!